Choucroute Garnie, easy main course from Thyme for Cooking. Like many classic peasant dishes, a proper Choucroute Garni will feed a very large family, and normally will have several kinds of pork, ham, sausage, and possibly even duck. This is a scaled down version. Open and drain kraut. Taste it, if it's really, really strong, rinse it briefly with cold water. Chop onion and mince garlic. Heat oil in deep skillet. Add onions and garlic and sauté until tender, about 5 minutes. Add drained kraut and all of the rest of the ingredients except sausages and bacon. Stir to combine, cover and simmer. Fry bacon in a large skillet until crisp. Remove. Add sausages to skillet and brown lightly. Crumble bacon and add to sauerkraut, stir to combine. 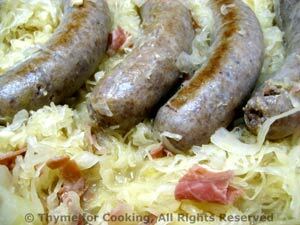 Lay sausages on top of kraut, cover and continue to simmer until sausages are done, about 15 minutes. Stir once or twice to combine flavors. When done remove sausages to a platter, spoon kraut around (removing and discarding bay leaf) and serve.